FDR, Truman, Ike, JFK, LBJ, Nixon, Ford, Carter and Reagan: ALL these eras with regard to the Secret Service are explored via many interviews and correspondence with former agents and White House aides and much primary research. This is the most readable, most illustrated (photos and news articles), most diverse, and simply the BEST of my three books to date (I have a fourth completed- more on that later)! I AM VERY EXCITED ABOUT THIS BOOK! My admiration for the Secret Service (especially certain agents) and my CRITICISM of their performance on 11/22/63 both come shining through. My first book was a very good textbook with a narrow focus (the Secret Service in regard to the JFK assassination); my second book was a very good reference book, again with a decidedly narrow focus (again, the JFK assassination, albeit the medical evidence aspect)…my third book is a great BOOK that demonstrates that I am no “one-trick pony”: I am interested in history, other presidents (beside JFK) and the Secret Service, in general (my fourth book carries my Secret Service expertise even further along, but I digress). While there haven’t been many Secret Service related books about U.S. presidents, the ones still in print (and even those long out of print) are often sanitized memoirs of a politically correct nature or “tell-all” tabloid historical junk meant merely for entertainment purposes. The Not-So-Secret Service provides the facts with the bark off, so to speak, and reveals politically incorrect information of a decidedly unsafe nature. It may be controversial and against the grain, but this book is heavily documented and timely, as the Secret Service guards our political candidates, foreign dignitaries, and, of course, the President, the first family and the ex-presidents and their families. Vince Palamara is the leading civilian Secret Service authority. His first book, “SURVIVOR’S GUILT: THE SECRET SERVICE & THE FAILURE TO PROTECT PRESIDENT KENNEDY” (2013), took over 20 years to research and write and has garnered much favorable reaction. His second book, “JFK: FROM PARKLAND TO BETHESDA- THE ULTIMATE KENNEDY ASSASSINATION COMPENDIUM” (2015), took over 15 years to research and write and has also garnered much favorable reaction. 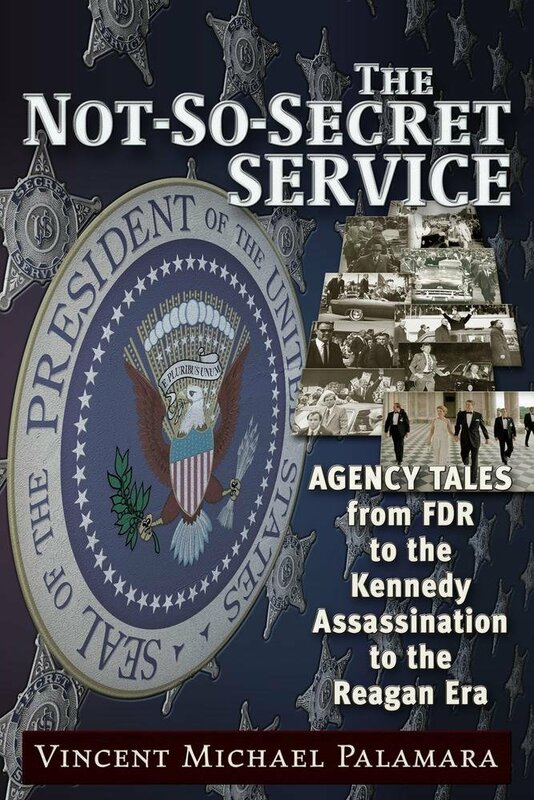 His third book, “THE NOT SO SECRET SERVICE- AGENCY TALES FROM FDR TO THE KENNEDY ASSASSINATION TO THE REAGAN ERA” (2017), took 10 years to research and write. Palamara has appeared in over 100 other author’s books, radio, television/DVDs, newspapers, at national conferences, and many online resources. Vince also appears in the DVD/BLU RAY “A COUP IN CAMELOT” (2016). This entry was posted in Uncategorized and tagged Clint Hill, secret service, the not so secret service, Vince Palamara. Bookmark the permalink.